It may not be woodworking, but we all enjoy a cold beverage of some description, and we have all been stuck on occasion wanting it cold a lot faster than conventional methods will allow. Here is a quick look at a way of using a power tool (drill) and a bucket of ice, along with a Spin Chill bit (from SpinChill.com who I found through Kickstarter (crowd funding)) to get a bottle or can to drinking temperature in 60 seconds. When you are used to using power tools and machines for your woodworking, it is easy to forget that sometimes a handtool is the best tool for the job. Scraping has its benefits. It avoids tearout, as the blade is not parting material ahead of the blade – lifting and cutting. Think of all the adverts on TV about shavers, where the blade lifts and cuts the hair. If you are lifting timber, there is a chance more will lift than you intended, and tear out. Scraping has the blade at a different angle of attack, with the cutting edge trailing behind, rather than leading the way. Scraping is used in a number of hand tools. For planing a surface with torturous grain (burls and the like), you can get planes with the blade set vertically for a scraping cut. You can use scrapers (a piece of steel with a fine burr to perform the actual cut) as an alternative (and superior to) sandpaper. And you can use a scratch stock as an alternative to a router. It is a very simple tool – a piece of spring steel with the required profile cut into it. And a holder. You can make your own, or check out this one from Hock Tools (Ron Hock being very well known for the quality of his plane blades). 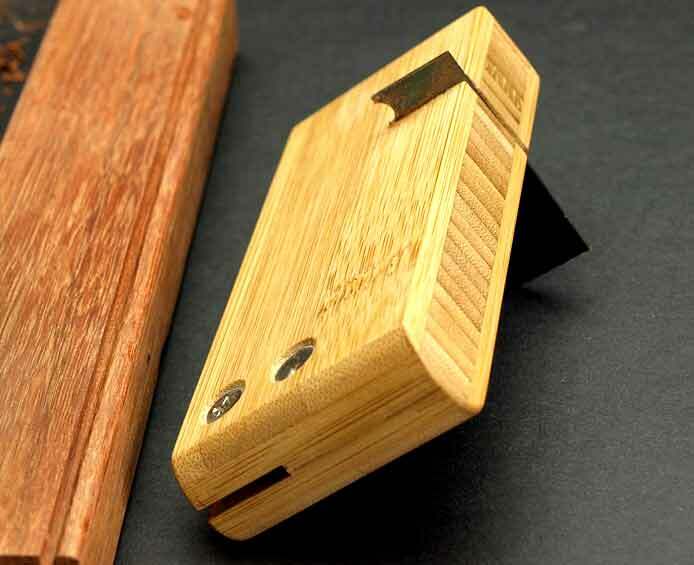 This is available from Professional Woodworkers Supplies in Australia, who sell items from the Hock Tools’ range. The body is made from a laminate of bamboo, which has good water resistance, and shape stability. Instructions for using the scraper can be found here. Where noone would consider manufacturing their own router bit, this comes with a second piece of tool steel so you have plenty of opportunity to create just the profile you want. I came across an interesting concept while looking at these scratch stocks (and especially the supplied profile). It used to be quite common for this profile to be used on the leading edge of a kitchen bench….underneath. The purpose was as a drip arrestor. Any liquid spilling and running over the edge would gather at the bottom of the curve of the profile and drip off, rather than continuing on its journey into one of the drawers (often the cutlery!) Simple idea – pity it seems to be forgotten by modern kitchen manufacturers. A very simple concept, a very simple tool, the ability to make your own profiles, and the ability to deliver that profile just where you need it, right out of reach of powered tools.